I make soap and I always look for an oil that will stand up to the challenge. The Olive Oil Pumace far exceeded my expectations. The quality was on point and the price is unbeatable! I have looked for other products elsewhere to compare to this one...still looking because there is no comparison! Thank you Webstaurant! This was a huge tin! This olive oil has a nice subtle flavor and will last a long time. It has a great price compared to what you can get in stores. I've been using this particular oil for years for a variety of my products. It consistent quality always has me ordering more. I do wish they would not put more than four gallons in a box as the weight is too much for the boxes to handle and the tins have arrived rather bashed when shipped eight to a box. Bashed tins are hard to store. Love this olive oil. Great for cooking and pan frying. Tastes great. This is so much cheaper than purchasing at the grocery store. This is a great price for olive pomace oil. I can't speak to the quality for food consumption as I use it for making soap. I'm going to try it out for frying and if it works out well, I will probably being ordering double the quantity. 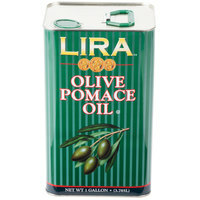 Quality olive pomice oil that is great for cooking, soap making and baking. I'm so excited because this company offers such a number of products that are amazing. This is a good quality olive oil at a very affordable price, I am always very satisfied with this product when I purchase it for the restaurant! Our Chef and our customers are very happy with the quality of this product, its a repeat purchase for us. Consistency is always right on! Love the olive pomace oil so much. The quality is superb and its great for greasing our baking sheets when making our flatbreads. A great can too. Excellent product with all the qualities of our more expensive olive pumace oil from our current vendor. It is a great buy; I would highly recommended. Wonderful product savory, smooth, tasty. Service was great, right on time, professionally packaged. Product priced reasonable. Thank you for doing honest business with us. We appreciate it very much. My children and I used this to make homemade soaps for holiday gifts! They came out perfectly and my children enjoyed the fun activity too! I would highly recommend! The olive Pomace oil is a great oil for basting our breads. The tin is a great quality and is perfect quality. I love the olive oil for dipping bread as well. We use this in our house Italian dressing. It has a smooth taste, the price is great, and the rectangular tin make storage in our inventory room very simple. We have been using this olive oil as a replacement for other oils when sauteing, grilling, even baking pizza dough. It seems to perform well for all of these tasks and the large container means we don't have to purchase multiple small bottles from the store. Originally the handle on the tins was metal and the last time it was plastic which does not seem like it will hold up as well. I has not broken yet, but I don't trust it as much to carry by the handle with the new design. Love this olive oil - behaves really well in my soap, but the price rises every time I come to the website! I wish that it would stabilize a bit so that I could cost out my good better! Sir Clean recommends this product Olive Pomace Oil - 1 Gallon Tin, if you like olive oil, you gonna love this one, we use everytime for cook, its excelent. The oil has no strong smell so it is great to use for my soap making. The spout comes out easily though it's difficult to control when it's full. I'm very happy about the oil in the can and not in the plastic. I use this oil to make my soap. I get a great product with no noticeable difference in quality from the more expensive, virgin or first press olive oils. This is a very cost effective, quality product, at one of the best prices that Ive been able to find for a small batch maker like myself. In stores like items cost about twice as much. Perfect for my needs! This olive oil is great for making soap. And at this price, I couldn't pass it up! Great quality, great price. I use this oil for my cold process soapmaking. All of my batches have turned out superb, and this is the best price for olive oil that I have found thus far. I will definitely be ordering again! This is an excellent product for soap making. I use it in all of my soaps. I searched everywhere online to find the best pricing and this is it! High quality and best pricing even with shipping fees. I also use it to cook with every now and then. Bellissimo! This is a great product and the best price around. Very simple to pour into squeeze bottles for daily use. Will definitely order again and again. I'm the "soapstress" for Cielo Soaps and this is the best olive pomace oil I have used. I like the convenience of the tin, which makes it easier to lift and pour. High quality! Would highly recommend. We use this in our little cafe to make our house balsamic vinaigrette and everyone loves it! This is a great product at an even better price. Regular olive oil is really expensive, so it was a relief to find this product. The lightest olive oil I have cooked with, which is exactly what I was hoping for it. It has little taste and a high smoke point, making it the best choice among olive oils for high heat cooking (such as deep frying artichokes or calamari). Very good value, apart from the understandably high shipping cost for this heavy item. one gallon size pomace Olive oil is a great addition to any kitchen home or professional it's a super tasting olive oil and at a fantastic price I like quality and value this is both . This is a great all around oil. I am cooking every day and this had become a staple in my kitchen. When you are looking for a clean oil with a high smoke point this is the one. Olive Pomace Oil is used every day in our home kitchen (mainly for marinades and frying). The tin comes with a handy "pop-up funnel" which makes pouring easy. Having said that, we still have a smaller container next to our stove for convenience. The best olive oil brand and big savings, especially if you are restaurant owner. Good finds here in webrestaurant and it has a good quality. This is a great oil to use in when we make our own salad dressings. Also husband uses this to coat meats he is cooking. The price is great and come in a nice container that has a closed top to use when you are done. Perfect in our Italian dressing and a light layer for our breads. Its used anytime when someone wants oil on a sub as well. The packaging changed since I purchased this, but the Olive Oil still tastes the same. It is light and perfect for dressings. There were 3 main things we used this for and all were wonderful. The first 2 were home made robust Italian dressing for salad and Garlic Butter/Olive Oil spread (served warm) with fresh herbs for dipping fresh baked breads and rolls for dinner. The third use was as a butter substitute for my grilled cheese made with wheat bread 1 thin slice of Cheddar, 1 slice of Provolone and a sprinkle of Parmesan cheese. This is a good oil with a nice mellow flavor. The higher smoke temp does help with cooking over her gh heat. I Will definitely buy again. I love using this olive oil in cooking and on stir fry and in salads. The one gallon is a good price and size that beat store prices by far. This is a really great olive oil. The color is fantastic and so it the smell. Love the packaging too because it's very easy to store. This is the best olive oil that I have tasted in a while. It is the remnants of pressed olive oil. One must save the best for last. The olive oil is used in many recipes from salad dressings to meat marinades. It really tastes great on a piece of toast with a glass of wine. A very good deal on this oil as compared to the bigger box stores, we purchased a couple of these and still have some left over, and the taste is good. Great price for great quality! We use it for everything from pastas to salad bar items. Not heavy olive oil taste, just perfect for making dishes without the overwhelming oil taste. Great Quality, Fast Shipping, I use a lot of Olive Oil in large quantities. I will be purchasing again soon! Very good, economical oil. Can be used in a variety of applications as a recipe ingredient. i it in my salad dressings. I definitely recommend. Olive Pomace Oil is a very good product for cooking. It gives no smoke even when chopped garlic turns brown. Including the shipping, the price is still much cheaper than that in most grocery stores. Before I ordered, I was wondering about the color of the product and how the cap of the tin can looks like after being opened. My friends and family members also wonder about the color. The design of the cap makes it very convenient and easy for pouring into a smaller glass bottle. Strongly recommend it. I use for soap making and cooking. people who do not like the strong flavor or olive oil like this. It's less expensive than store bought even with shipping costs. I keep a bottle with a pour spout next to the stove. Thank you! This olive oil has a great price. We use this olive oil for soap making. It works for all of the soaps we sell in our shop. we love the flavor of this Olive Oil, and the gallon size is a great value for our cafe or home where we use lots of olive oil. when it comes to olive oils I love the pomace oil brand. it blends well when making sauces. or used by itself on many other dishes. I mainly use this to cook with but it taste good in dressing as well. I only buy pumice olive oil because of its higher smoke point. I could not be happier with this product!!! It has a beautiful texture and a lighter flavor that prevents more subtle herbs from being overpowered by a stronger olive flavor. To use a healthier oil, I have used this in baked goods I wouldn't typically use olive oil in because of its lighter flavor. Delivery was fast and the price reasonable. I will be a repeat customer!